Home » Daddy Date! 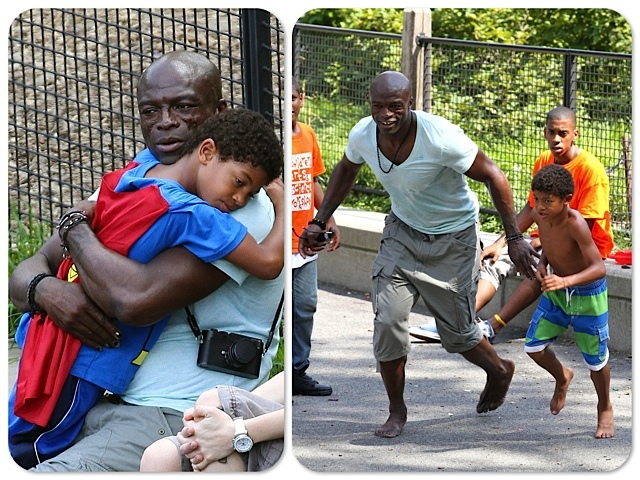 Seal Hits The Park With His Brood! Just a couple days after being spotted on a massive yacht in Sardinia, Seal was photographed enjoying some time out with his kids in New York City. While accompanied by a group of nannies and security, the singer resumed his daddy duties and treated his kids Leni, 8 Henry, 7, Johan, 6, and Lou, 2 to ice cream and some time at the park. Always carrying his camera, Seal captured pictures of the kids playing after tag with them. The family often spends the Summers in NYC while Heidi works on her East coast business projects. While her kids were out with their dad, the Supermodel was doing the talk show circuit promoting the new season of Project Runway, which debuts tonight. It appears that daddy’s rule is just have fun as Henry was in superhero mode in a Superman tee with a cape attached. The ladies, however, kept it chic. Leni was cute in a jean skirt and floral shirt, while Lou wore a bumble bee tee, and embellished sandals.